Damian Reeves was relieved to get his first goal for Gainsborough Trinity under his belt as a 4-2 home win over Matlock Town left them sitting pretty at the top of the Evo-Stik NPL Premier Division. The former Altrincham hitman said: “It’s always nice to get your first league goal for a new club and I think it’s important to get it as soon as you possibly can. “I would imagine it would be the same for Ross (Hannah) - he’s scored today and got off the mark as well. Once you’re off the mark it relaxes you a bit. He added: “In the early part of the season, especially in the early part of games, you need something to get you going. “The first few games prior to this we have been getting opportunities but not converting them. “The first game against Nantwich, we didn’t really create much, but today in the first 15-20 minutes we’ve played them off the park and could have been 5-0 up. “We finished the game with four goals but we could have probably had eight. However, Reeves admitted table-topping Trinity are far from the finished product as yet and need to tighten up at the back. “We went in 2-1 up at half-time and got a bit of a dressing down off the manager because of lapses in concentration at the back,” he said. “We are not the finished article and it would be silly to say that we are. We made some silly errors at the back today that cost us two goals. 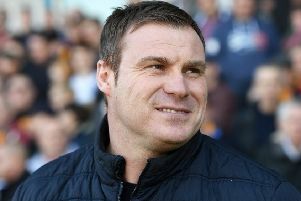 However, he admitted anything less than the play-offs would be a failure for a club striving to get back into the National League after their first relegation in their 145-year history. “Since I have come to the club the way the manager wants us to play and the players he is bringing in, it is all geared to promotion,” he said. “The aim has always been for promotion. If we didn’t finish in at least the play-offs it wouldn’t be a successful season with the players we have got and the way we are playing football.